At the start of the 4th quarter, the Seahawks held a 24-14 lead. No team in the 49 year history of the game had ever overcome a double digit lead in the second half. 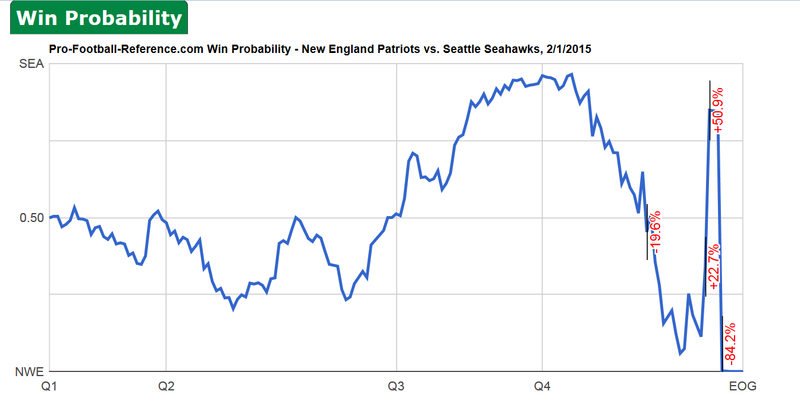 The odds that the Seahawks were going to win was 96.5%. If you are a sports fan, you know how it ended. With a brilliant Patriots comeback and the worst play calling in the history of the Super Bowl by the Seattle coach. Second half comebacks are the stuff of legend. It’s the stuff of movies and aging athletes’ stories. What’s it have to do with you, me and business? I’m not saying that my first half was terrible. In fact, I’m pretty pleased with how the first half has gone. There have been some disappointments, certainly. My il-fated sidetrip to the mid-west comes to mind. But, there have also been some really, really good days. I got to work for Microsoft during a time of incredible growth in the computer industry. I got to travel. I got to write books and teach classes. It’s a question that any of us can ask, and not just when you turn 50. College graduation is a halftime moment. You are leaving school and starting a career, typically. My friend Howard reached a halftime moment while at Novell and turned the second half into a cartooning career. In fact, every moment can be halftime. All we need to do is decide that we are going to make a change. As I look forward to the second half of my career, I’ve spent a lot of time thinking about what it should look like. What do I want to be when I grow up? What activities give me joy and excitement and which ones do I dread? What have I shown that I can be good at? More education: School was always a means to an end for me. But, I love learning. I want to spend more time just learning new stuff because it’s interesting. More writing: I appreciate all of you who follow this blog. I’ll keep writing it, but I also want to write novels, screenplays, songs and comedy. More reading: Reading can take you anywhere in this world or beyond. I love to read and need to make more time for it. More work: Sounds weird, I know. But, I still have things I want to accomplish in my career. I want to teach, I want to be in a position to share waht I know, or think I know about business. I also want to be influential in my company and industry. I really like the idea of a Chief Data Officer. More play: My kids are growing up, but the ones at home are still young enough to enjoy camping, basketball, bike rides and just hanging out with dad. And as they get older, my grandkids will be around. Remember that setting yoru game plan, doesn’t mean it’s set in stone. It simply means you’ve started on a journey in a particular direction. Regardless of your point in life, tomorrow is always the start of second half. Whether you are going into the second half tied, up big, or down by 10, you have the ability to make adjustments. Be your own coach and make your second half even better than the first. When I wrote this the bulleted list was actually little dots. I’m not sure if I’m okay that my future goals look like error messages that need to be cleared.